The pungent green leaves of Wood Garlic now cover much of the woodland floor. At this stage the young leaves can be eaten as you walk along or used in salads and other dishes where they can replace chives or onions. 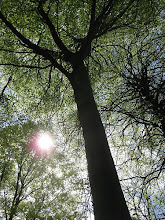 Soon the lower part of our Cotswold beech woodland will be a carpet of white flowers and green leaves.